Established in the year 1994, an ISO 9001-2008 certified Fair Deal Engineers, are among the prominent Manufacturing and Trading of an extensive array of the best quality of Printing & Offset Machines. Consists of Variable Data Printing Machine, Scratch Card Line and Mini Offset Printing Machine, we offer a wide range of products. These printing and offset machines are manufactured as per the industry set norms by using advanced set norms and regulations. Due to their energy efficiency, high performance, low maintenance, user-friendly operations and longer serving life, these printing and offset machines are highly demanded in various industrial printing and designing applications. We are basically deal in our local manufacturing brand name "Fairprint". Under the supervision of our Business Development Manager Mr. Ankush Ahuja we have been able to cater to the precise needs of our valuable customers. Owing to his excellent management skills, innovative business ideas and customer centric approach, we have been able to meet the diverse needs of our customers in the most efficient manner. Manufacturing and Trading of Printing machines and printing products. "Creative, Enthusiastic & Consumer Centric people in a State of Excellence providing Innovative & Compelling solutions for Diverse Global Customers while Dominating the market"
Our vision ensures the driving force so that our clients receive quality printing machines at competitive prices. Our organization has hired skilled team of professionals who have rich industry knowledge and experience. Our team of dedicated professional works close-coordination with one another round the clock in order to meet the variegated requirements of clients.Under the strict supervision of our workforce, the offered machines is manufactured using advanced technology. We are supported by our skilled team of professionals who work with full dedication to ensure the delivery of high quality machines within time. We are supported with a world class infrastructural facility that is divided into several divisions such as production, quality control, manufacturing, procurement, warehousing & packaging, etc. This infrastructural facility helps us in the manufacturing of best quality range of products. This infrastructural unit is installed with all the ultra-modern tools and machinery in order to complete specific needs of clients within the promised time frame. All these process are operated by our skilled team of professional. 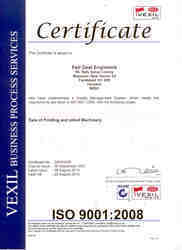 We are a trustworthy firm, engaged in manufacturing, trading and exporting Variable Data Printing Machines with Online Perforation, Scratch Card Line, Automatic Perforation Machine, Mini Offset, Poly Offset, Non-Woven Bag Printing Machines (Single Color, Both Side, Two Color Satellite, Two Color, Three Color, Four Color ), Non-Woven Bag Making Machines, Pack to Pack Computer Stationery, Answer Sheet Numbering, Numbering & Barcode Printing Machines, Envelope Making Machines etc. We have strongly settled our business in the domain owing to the offered elevated quality array of Variable Data Printing Machine, Envelope Printing Machine, Offset Printing Machine, etc.